During July, NAOS had the opportunity to participate in the Royal Flying Doctor Oz Outback Odyssey, an eight day trip driving car 1928, a 1969 Ford Fairlane, departing from Adelaide, South Australia travelling through SA Mallee, The Darling River Country & Western Queensland before arriving at Cotton Tree, Queensland all in aid of raising money for the Royal Flying Doctor Service. The Royal Flying Doctor Service (RFDS) is one of the largest and most comprehensive aeromedical organisations in the world, providing extensive primary health care and a 24-hour emergency service to people over an area of 7.69 million square kilometres. Medical services needed by people living in rural and remote areas of Australia are no different to services required in our large cities, but the vast distances that small rural populations must overcome to access health services provide a real challenge. 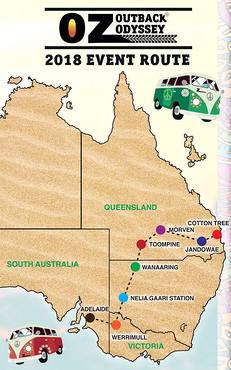 The Royal Flying Doctor Service works to assist country Australians in many ways. NAOS is proud to be a corporate partner of such a great cause. 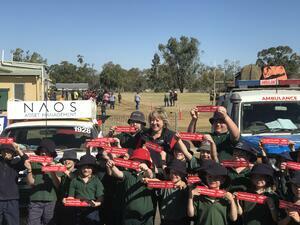 On day one we headed off on our 3000km journey from Adelaide to Werrimull. After a big send off from the National Motor Museum in Birdwood, we made our way to the new Bends Raceway at Tailem Bend to complete two hot laps before going on to Werrimull to finish the day. 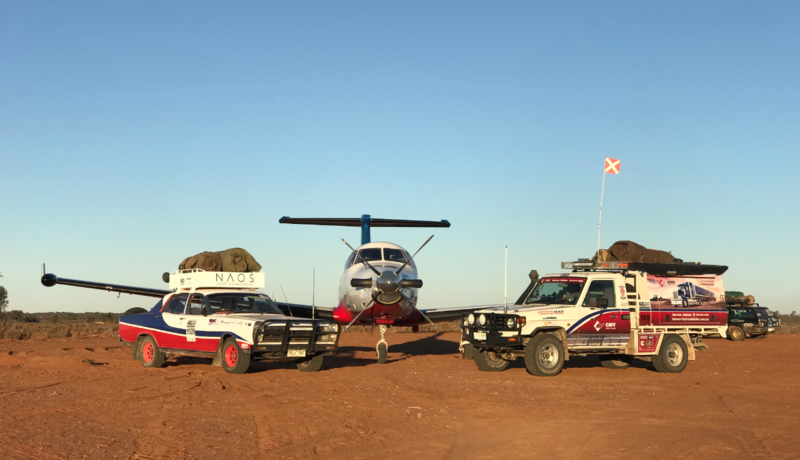 Day Two saw us finish at Nelia Gaari station where one of the Royal Flying Doctor planes met us to take a few lucky participants for a joy flight over the Menindee Lakes System. By lunch on day 3 we hade another ‘hot lap’ only this time on a dry lake bed at Coona Coona Station which was a lot of fun. Unfortunately, this pushed car 1928 to the limit and as we left for Wanaaring, five nuts from the back left wheel blew off whilst we were travelling at 100km on a dirt track. After a few hours and a lot of discussion we managed to get the wheel back on to the car and drive very gently into Wanaaring that night. On day four we made our way from Wanaaring to Toompine (the pub without a town) where we would stay for two nights. A motorised esky race along the way was a nice way to break up the drive with team 1928 winning with the fastest lap. Day five brought with it a very challenging four-wheel drive section, where unfortunately a creek crossing got the better of car 1928 and we had to be towed back into Toompine. Getting towed behind our support vehicle on a dirt track wasn’t a lot of fun and the team ended up a nice shade of orange after we were absolutely coated in bulldust. From Toompine we travelled east through Charleville before arriving at Morven. The country was starting to look much better and we started to finally see some grass! Day 7 saw us leave Morven and head to Jandowae with two very fun and fast dirt tracks occurring along the way. For the seventh day in a row we were overwhelmed by the hospitality and generosity of the outback communities along the way, particularly given the tough drought conditions they are currently experiencing. On the final day of the Odyssey we travelled over the Great Dividing Range and down into Cotton Tree for the final dinner where a cheque was presented to the Royal Flying Doctor Service for $153,500 on behalf of all the OzBash teams. Supporting our commitment to Environmental, Social and Governance issues, NAOS Asset Management (the management company) aims to donate 1% of our management fee revenue to the community and environment, of which the Flying Doctor Service is one of the recipients. If you would like to know more about the work that the Royal Flying Doctor Service is providing to Australians, please click here. Read further insights by the NAOS team on Our Commitment to the Great Barrier Reef.